Home » Past Obituaries » G. L. Moss Jr.
Memorial service for Mr. G. L. Moss Jr. will be 1:00 P.M. Saturday, December 8, 2018, at Ligon & Bobo Funeral Home with Rev. Jason Mikel officiating. Interment will be at a later date at Conatser Cemetery. Visitation Saturday 11 AM – 1 PM at Ligon & Bobo. Mr. Moss, age 84 of Nashville passed away at his home Wednesday, December 5, 2018. Born December 7, 1933, in Elmwood, Tennessee, he is the son of the late Garland Letcher Moss Sr. and Cora Russell Moss. 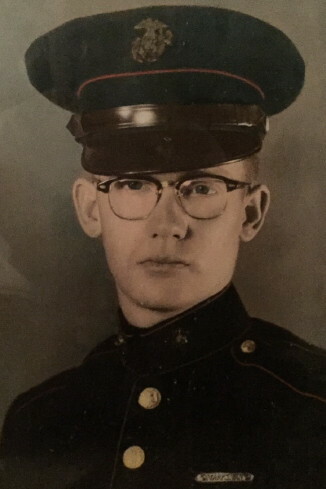 He served in the United States Marines, and had worked for America Home Design as a salesman. In addition to his parents, he was preceded in death by his wife, Jackie Ann Malone Moss. He is survived by two daughters: Teresa (Pete) Francescon and Karen (Calvin) Mutschler; three grandchildren, Brandi (Kenny Monk) Francipane, P. J. Francescon, and Jaclyn (Jamie) Van Frank; four great grandchildren, Drew & Devin Davis, Kendall Monk, and Keyna Francipane; great great grandchild, Emerson Davis; and a sister, Edith Thornton.